I'd like to thank Joseph and Robin for their comments on Revit Calendar at revitforum.org. And a huge thank you goes to Oscar Lopez, curator of my morning ritual BIM WORLD. Seeing my own post there was like being on TV! It's an honor to be there! Thank you Luke! -You can use it in an evil or good way right now. 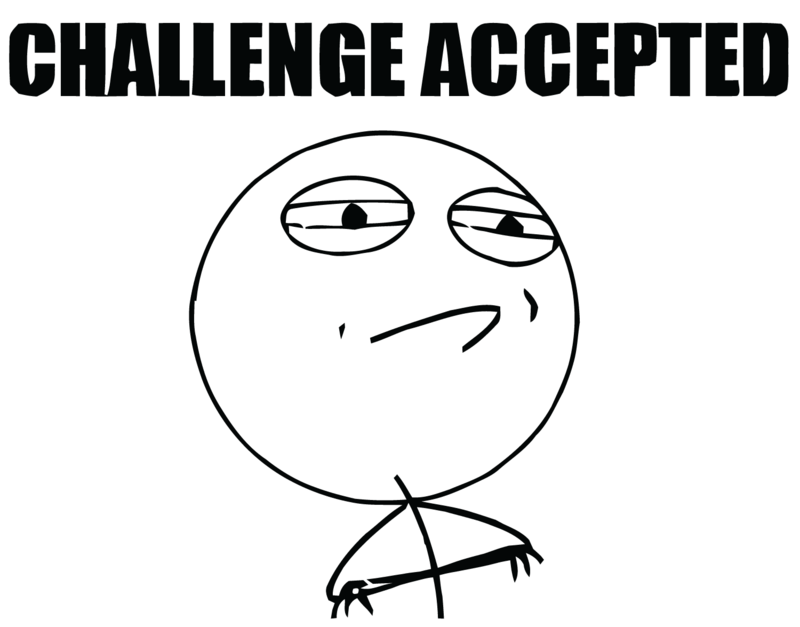 Put a Comments label in it, adjust a date and place it on views in a work shared environment saying.. Evil: "Yes! 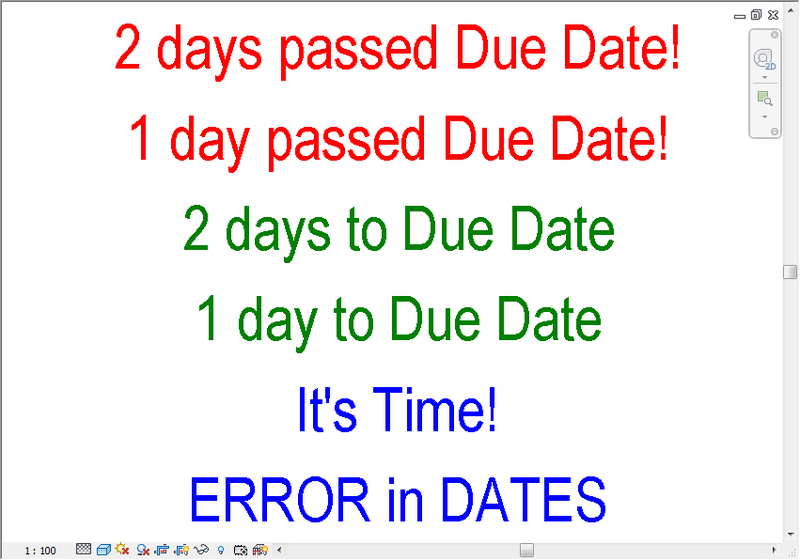 That deadline was yesterday! DateA and DateB. Family expects DateA to be earlier than DateB by default. 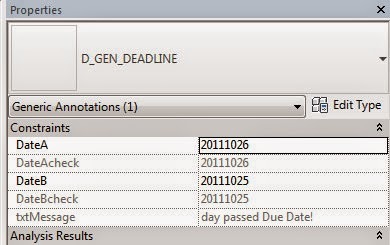 DateAcheck and DateBcheck. These parameters show how the family interprets the dates we've entered. And there's a txtMessage parameter with 6 possible outcomes. Julian Day is the continuous count of days since the beginning of the Julian Period used primarily by astronomers. A count for each Date means I can subtract one from other to find the days in between. This would be easier than I've thought! I also didn't want to have 6 entry parameters(y/m/d) for two dates so I've made 2 integer parameters which I parse into y/m/d and correct with DRV(drive) parameters and concatenate back into check parameters. year(at least 1 digit)month(2 digits)day(2 digits). So the earliest date you can enter is 10101. Parsing (Probably called something else!) done by getting the correct decimal places. I've used the same day / month / yearDRV(drive) parameters from the Revit Calendar. I've repeated the above steps for DateB. BJulianDay - AJulianDay is the Droid we are looking for! Usually I nest formulas when I believe they're working OK to reduce the number of parameters. For readability I didn't do it in this family. Hi all. I've been blogging about Revit in Turkish for a time. (revitkutuphanesi.com) And I'll give it a try to do it in English here to interact with more people. I was working on my LOD 300 Rebar Calculation add-in for Revit. For a week or two I was so concentrated on understanding and solving the problem, when it finished I've felt a little bit blank. Had to do something Cool and pretty much useless to get over the boredom. 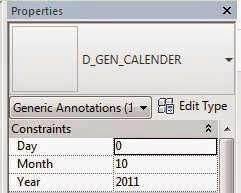 The calendar family has 3 data entry parameters. Day, Month, Year. 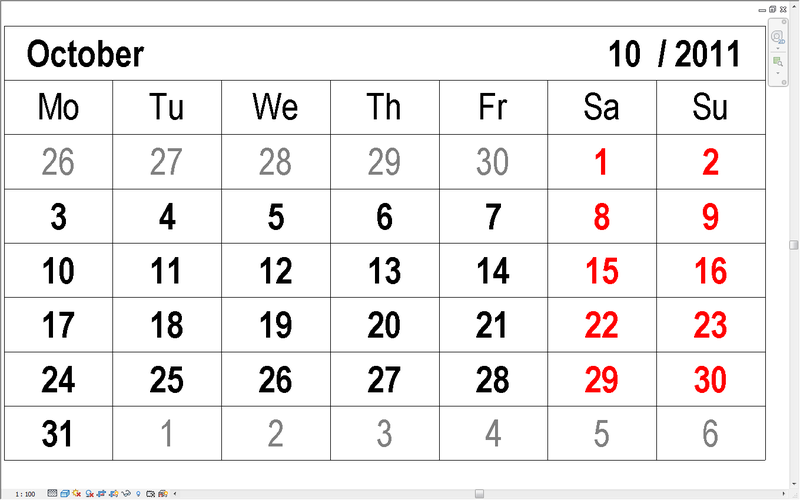 If the Day parameter is Zero, it will basically show the monthly calendar. 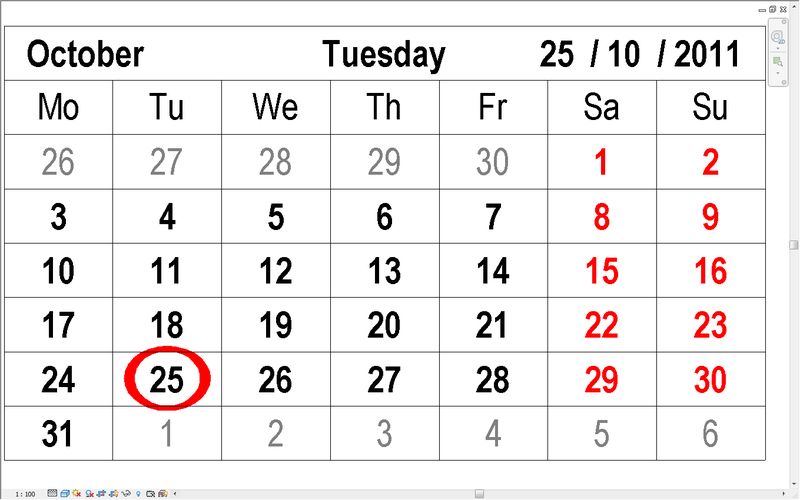 If you enter a nice date (like my Son's b-day) it will add the day of the week to the title and highlight the date. Although the family has some DRV (driving / correcting) parameters it doesn't cover negative years. I'm sure it can be added to the DRV formulas but I didn't want to spend more than an a hour on it. Had to figure out if the entered Year is a leap year. After searching the internet for a decent algorithm, luckily I've found this one in wikipedia. Revit does not have a modulo operator (finding the remainder of a division) in its syntax but you can use the roundown trick to find mod x = 0. If it can be divided to four without a remainder, it should be equal to the rounddown of the same division Right? 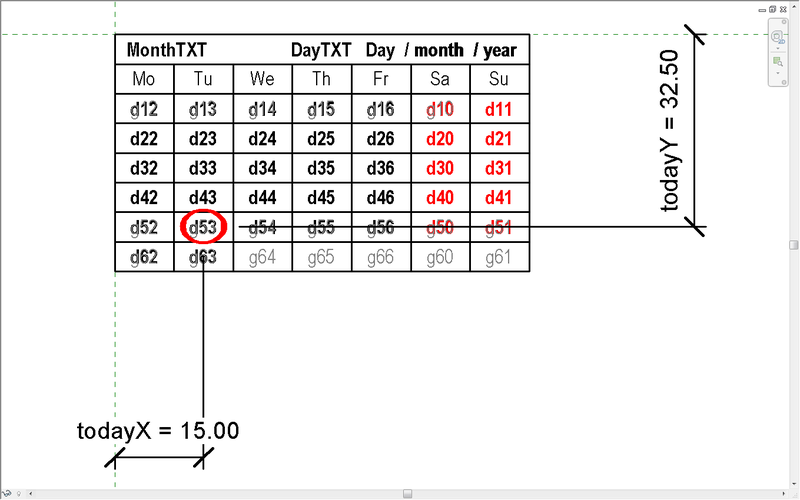 Rest is adjusting the formula with ifs and nots..
To start the month I had to find out the location of the first day in the table. Again it was lovely to find out a page dedicated to this in wikipedia. K the year of the century (year mod 100). DAYS are all we need. GRAYS are just the decorative ones showing values from the last / next month in.. well.. GRAY. Notice the first group of GRAYS start from g12 to g10. This Month has to start somewhere in the first week! and the last day that can be is Sunday (d11) so the GRAYS should end there. As this group of GRAYS show the last days of the last month I needed to figure out the count of the days in the last month. Labels from g12 to g10 are counting down from that number before the first day of this month and g12v to g10v are controlling the visibility of these labels. And the count of the days in this month. (cntDAYS). Second part of the GRAYS (g52 to g61) just count from the end of this month. 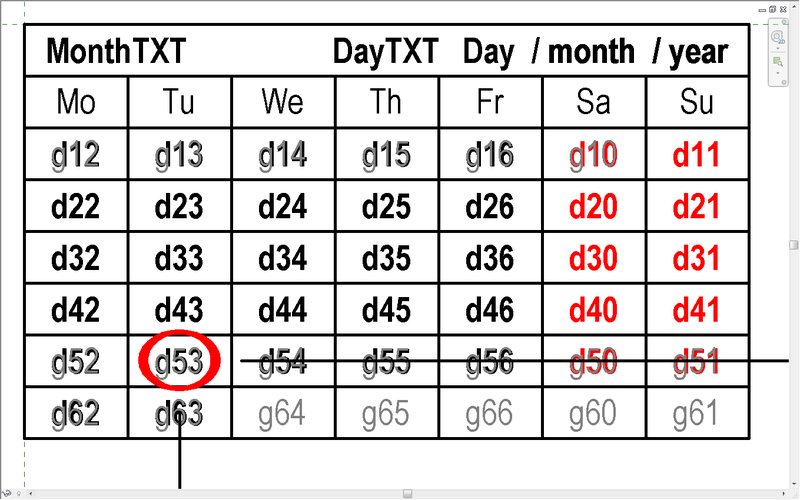 These Labels start from g52 because the earliest this month can start from is Monday (d12) and shortest this month can only be is 28 days. ©Mehmet Polat Diker. Awesome Inc. theme. Powered by Blogger.